How was your weekend? Hope you had a great time! I was very busy this past weekend. A lot busier than I expected (it was the Mid-Autumn Festival) and so I wasn't active on social media or the blog at all. Promise you I didn't fall off the face of the Earth or anything, plus I am back now. By the way, did anyone see the lunar eclipse last night? It was beautiful! 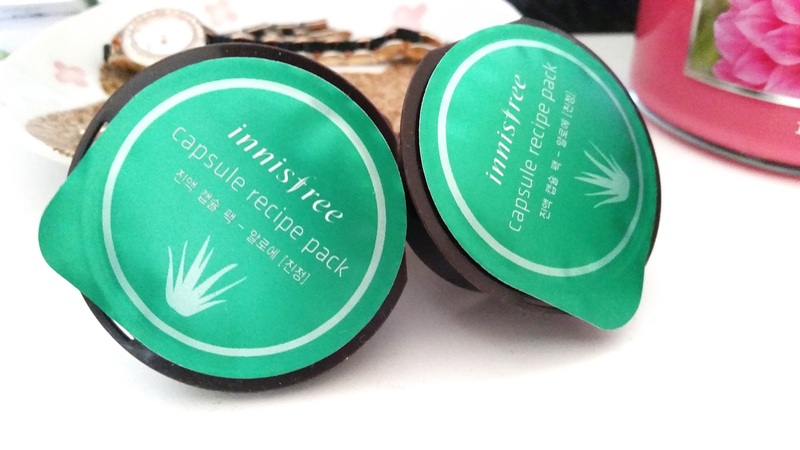 Anyways, this Mask Monday I am going to be reviewing the Innisfree Capsule Recipe Pack in Aloe. This is a wash off mask and part of the original Capsule Recipe Pack line that's all wash-offs. Innisfree now has a sleeping pack capsule recipe line as well. I reviewed a couple of their capsule recipe packs already (Green tea, Pomegranate, and Seaweed). I have all the recipe packs except for the clay pack because I read that it is much similar to their large size Jeju volcanic clay mask which I already have. Promise that I'll review the rest of the recipe packs soon! 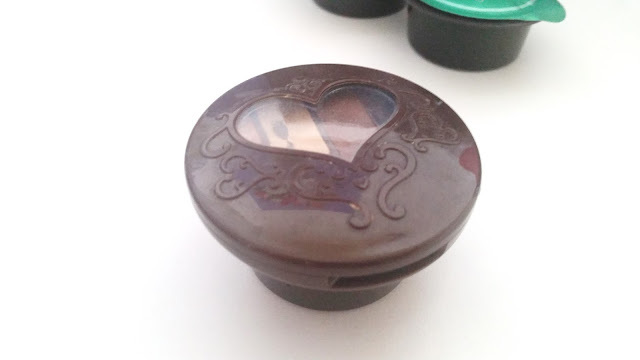 I was drawn to these tiny little k-cups look alikes for a couple of reasons. They look like they are travel friendly and there are multiple types to choose from. Their size is nice and if I don't like a capsule recipe pack I don't have to worry about wasting because it's a small size to beginning with. Despite its small size, each pack can last up to at least 4-6 uses and last up to 2 weeks without drying out (if stored properly). 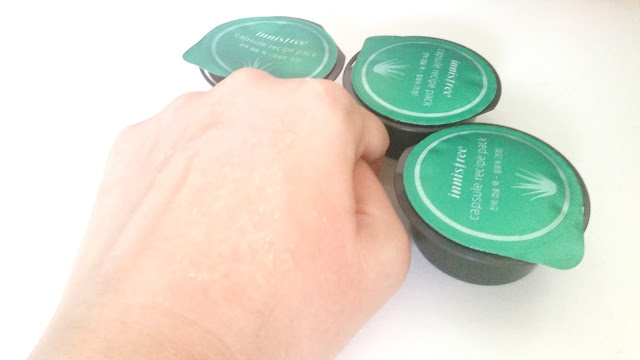 Finally, they are pretty inexpensive, especially when Innisfree has them on sale! Product Description: A soothing mask formulated with aloe to calm and hydrate the skin. This recipe pack is enriched with various botanic extracts to soothe irritate skin and leaves the skin soft and moisturized. While massaging the Aloe mask on the face, the mask's gentle scrub particles can help to remove dead skin cells. To Use: Cleanse the face first. Apply an adequate amount of the Aloe wash off mask and massage the face to relax facial muscles. Leave the mask on for 10 to 15 minutes. Rinse off after and continue with the nighttime skin care routine. Make sure to keep the recipe pack fresh by inserting the lid into the slit on the container. Pull it airtight to keep it fresh for next use. Ingredients: WATER, FICUS CARICA (FIG) FRUIT EXTRACT, CITRUS UNSHIU PEEL EXTRACT, ORCHID EXTRACT, CAMELLIA SINENSIS LEAF EXTRACT, CAMELLIA JAPONICA LEAF EXTRACT, OPUNTIA COCCINELLIFERA FRUIT EXTRACT, HYDROGENATED LECITHIN, PEG-40 HYDROGENATED CASTOR OIL, 1,2-HEXANEDIOL, CARBOMER, BUTYLENE GLYCOL, TRIETHANOLAMINE, BETA-GLUCAN, SODIUM POLYACRYLATE,XANTHAN GUM, BETAINE, ETHYLHEXYLGLYCERIN, LUFFA CYLINDRICA FRUIT, CHROMIUM OXIDE The GREENS (CI 77288), DISODIUM EDTA, DIPOTASSIUM GLYCYRRHIZATE, GLYCERIN, ALLANTOIN, CERAMIDE 3, FRAGRANCE, PHENOXYETHANOL, ALCOHOL, ALOE BARBADENSIS LEAF JUICE, PEG-32, ULMUS DAVIDIANA ROOT EXTRACT, AMARANTHUS CAUDATUS SEED EXTRACT, CENTELLA ASIATICA EXTRACT. Packaging: All Capsule Recipe Packs come in these little k-cup look alikes with a slit in the front. They all come in that deep brown color container and the only difference is the lid on top. That lid usually corresponds to a specific color for that specific product. For example, a dark-ish green is for Aloe while a magenta color is for Pomegranate. The designs on the packaging are really simple and to the point. It features a picture of the featured ingredient and the name of the product in both English and Korean. The bottom of the container have some information as well, however, it is all in Korean. The manufacturing date can always be found on the side of the container. 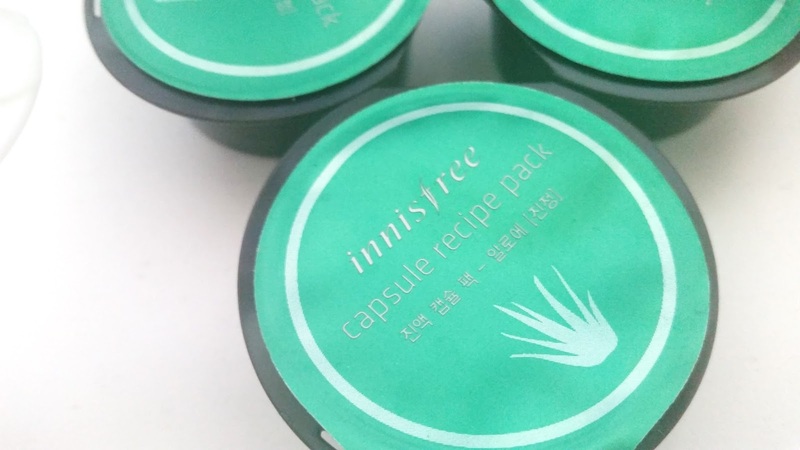 Scent: This Capsule Recipe Pack in Aloe has a fresh scent. It smells like aloe and cucumbers to me. The scent is not overwhelming and smells refreshing to me. Color: The wash off mask is clear in general with little pieces of aloe skin mixed in it. 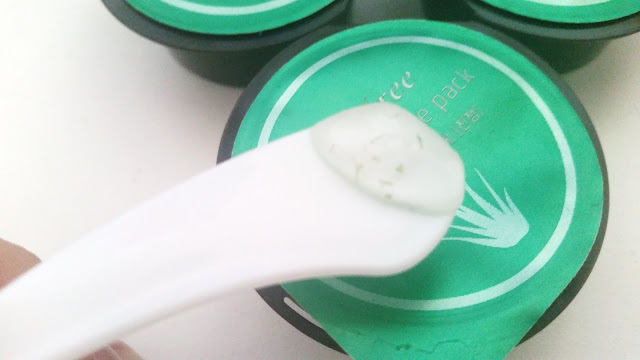 Texture: The Aloe Capsule Recipe pack feels gel like upon application. It's got little clear clumps that's soft and pieces of aloe skin as well. The clumps and aloe skin make the gel feel a little bumpy but the clumps can be massaged in to feel less bumpy. My Thoughts: I got the capsule recipe packs a while ago but I didn't end up testing it until a couple of months ago. I wanted to wait until I finish up a few of my opened wash off masks before digging into them. However, a couple of months ago, I decided I wanted something gentle and fast to use on days when I don't want to use my Cure Peeling Gel. So I looked to these recipe packs. Aloe was the first one I tested and tried because it seemed safe. Sure enough, it didn't cause me any issues. I have to say, they are not what I expected. 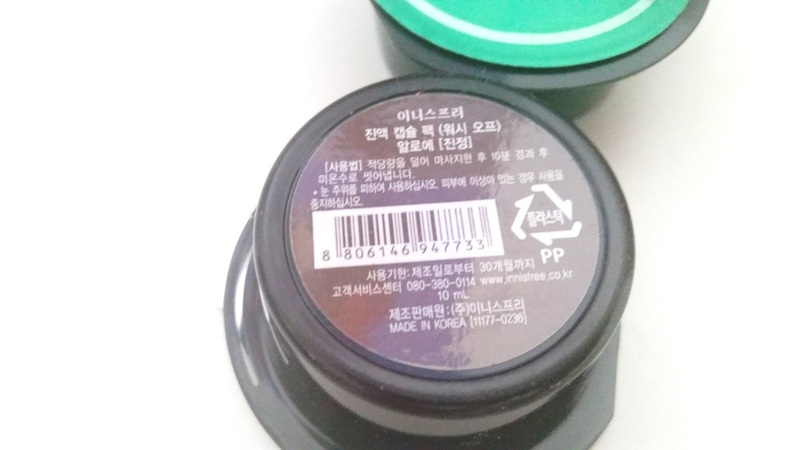 Innisfree's website labeled them as scrubs, although gentle scrubs, still scrub wash off mask. So I expected some type of scruby feeling. However, none of that. 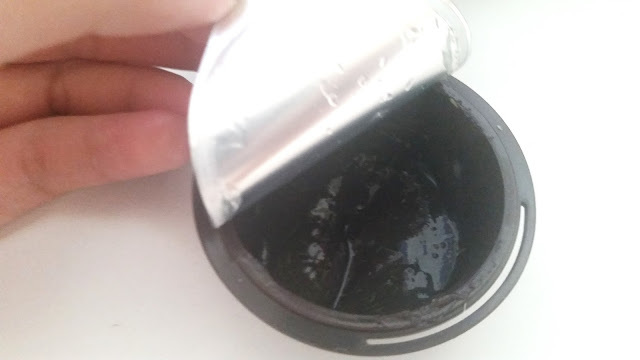 The little aloe pieces in the gel like wash off mask is as scruby as it will get, which isn't much at all. The mask also have little clumpy pieces that feel like little pieces of aloe but at the same time not. I guess when Innisfree said gentle, they really mean it. I thought I wouldn't like the wash off mask at first, however, I ended up really enjoying the mask. The gentle (hardly existent) scrub allows me to massage my face and do a light facial massage without worries. It feels soothing and relaxing when I use it which is very nice. The mask also helps to reduce some redness I get from the steaming shower, which is a plus, and it has a light cooling effect when applied. 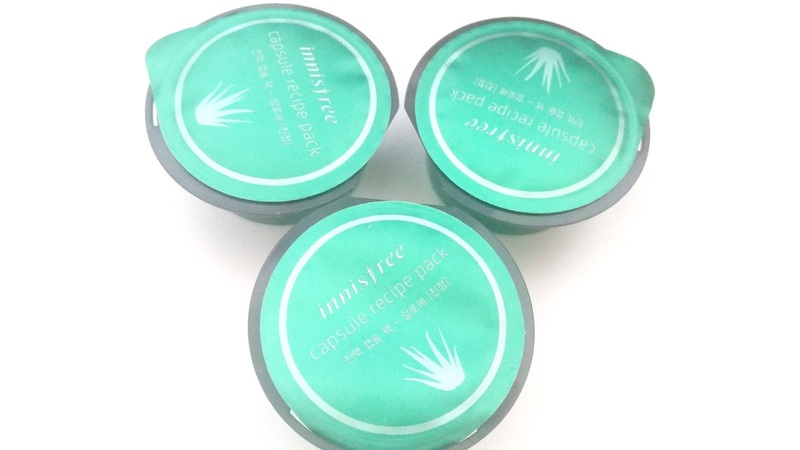 The primary function of the Capsule Recipe Pack in Aloe is to soothe irritate skin and I think it nails it! My skin always feels soothed after I use this mask. The mask always leaves my face soft. It reduces the redness on my face a bit as well. The Aloe pack also promises moisture effects, however, it seems to be lacking in that department. My mom and I both used this mask to compare our results. Mom has normal to dry skin type and she felt that the Aloe wash off mask felt a bit moisturizing on her skin but it wasn't enough for her. I have combo to oily skin type and the mask did feel a bit moisturizing on my face but not by much. So it seems that the mask's moisturizing effects weren't enough for either of us. I think this capsule recipe pack will be great for people who are looking for something that feels soothing on the face. However, if you are looking for a moisturizing pack, this might not be the one for you. With all Capsule Recipe Packs, there is an issue with the resealing of the mask. 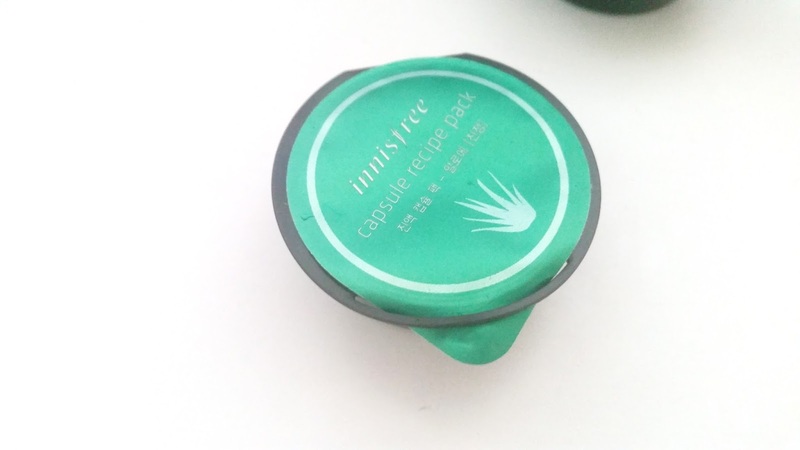 While Innisfree's instructions says to simply slide the lid into the slit and pull airtight, it doesn't always work. I think out of the dozens and dozens of recipes packs I've used by now, only 1 (yup 1), has actually worked via the method Innisfree mentioned. For all the other times, I used a separate lid or another product to keep the lid closed and the products fresh. Recipe packs don't have long life spans once opened. If stored properly, they can last up to 2 weeks. Any longer and you'll have a dried blob on your hands. So my suggestion is to finish the pack within 2 weeks, which is very doable. This is the slit used to reseal the pack. It doesn't work well most of the times. Using a mini palette to reseal the Capsule Recipe Pack. Final Thoughts: I expected more from the Aloe Capsule Recipe Pack. Sure there's already the soothing effects, which is very nice. However, the lack of moisturizing effects makes me a bit said. Since these days moisturizing and soothing kind of go hand in hand when it comes to aloe products. Would I repurchase this product in the future? Unsure. I love the soothing feeling the mask provides and that it can help reduce the redness on my skin a bit. However, the hardly there moisturizing effect it has feels like a let down. I think I'd like to try more of the other recipe packs before deciding on this one. Would I recommend this recipe pack? I think for those who are looking for a product that can soothe their skin and don't mind the very little moisturizing effects it has, it's worth a shot. However, for those who wishes for both soothing and moisturizing effects, this might not be the one for you.